Several days ago Uglegorsk (a town to the north of Debaltsevo) was seized by the DPR Army. Upon their retreat, Ukrainian forces called a “Grad” strike at the town destroying its center. People have been hiding in the basements for days being in the middle of front line between the militias and counter-attacking UAF groups. 3rd of February, 2015. Uglegorsk, Donetsk People’s Republic. The DPR Army is evacuating people of Uglegorsk today. Unfortunately, the Ukrainian army refused to cease fire, so the evacuation is being held under shelling. Pensioners and children are being evacuated in the first place. People will be accommodated in cities and towns next to Donetsk. The places have already been prepared for them, people will be provided with food. 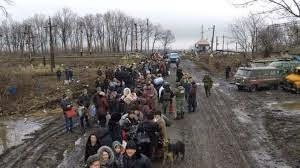 According to the human rights ombudswoman of the DPR Darya Morozova, around 600 people have decided to leave the combat zone. The evacuation of people is also being held in other settlements. Up to 200 people are evacuated every day. Very important! Watch full - screen to see the english subs.